Inspired by Louise Nevelson, second graders created a found object sculpture by working with their classmates. They could bring in an object or choose an object; then they chose where they wanted to glue it and voted on what color the artwork should be painted. At every Showcase, I display a piece of collaborative artwork that the classes worked on together. Sometimes, it comes together as one large mural-type display. Sometimes, four students will work together to create poster-sized art. Because the second grade Showcase was scheduled for January, I planned a project that they could complete in one art rotation. 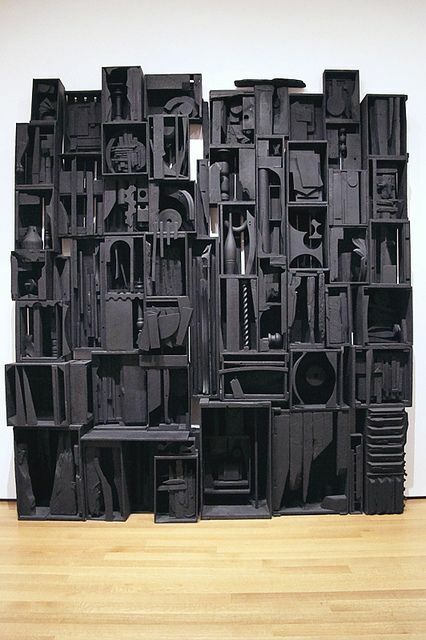 I started by sending letters home with my students, after we talked about Louise Nevelson and found object art. I emphasized that they would not be getting their objects back and that the object needed to be small enough that it could fit in your pocket. I had bags for each second grade homeroom so that kids could give their object to me early. By pure luck, I happened to have recess duty that week, so I also collected their objects in the morning. I emailed the faculty and staff at our school, asking for donations of partially used spray paint. We ended up with so many contributions! I also scavenged in my classroom and found a bunch of random objects that students could choose from if they forgot to bring an object. I asked the office to save a few cardboard lids from our paper boxes. It was pretty cool to be creating a project using all donated and free supplies! On the day of the project, we started by talking about found object art and voting on what color the class wanted their sculpture to be spray painted. They chose between two different colors. I have three 2nd grade classes each day, so I recorded each class’ vote and explained that the color with 2 or more votes would win. During class, I had a drawing project that they were working on at their tables. I called up one group at a time and had them show me where they wanted their object glued. After I put the hot glue on the right spot, they could choose to place their object themselves. It was so much fun to see the second graders talking about the sculptures with their families at the Showcase. There were big groups of people who stood and observed the art for a long time! The students were so excited to search and find the object they had added. Elementary art students worked together to create installation art using everyday materials and displayed them on campus. Supplies: Whatever extra stuff you have crowding your cabinets! For our art program, I needed to do two things: 1) Fill in the weird schedule gap caused by our Field Days. 2) Use up the boxes of donated supplies that I wasn’t going to be able to move to our new school. Installation art was the perfect solution! I started by grouping our supplies into sets that would work well together. I had pipe cleaners, foam shapes, cardboard tubes, art straws, wooden blocks, popsicle sticks and bamboo skewers. The foam shapes worked well with the pipe cleaners and skewers. For the other materials, I gave each table an adhesive, like masking tape or hot glue. About a week before we started, I set up a hot glue station at the back of the room. Kiddos who finished their art project early helped glue the popsicle sticks into triangles and squares. Having those pieces ready to go really streamlined the building process. On the first day, each table brainstormed about how they were going to use the materials and where they would want the sculpture displayed. At the end of each class, they wrote a note for the kids who would be at their table next. I changed the set-up of the tables as each of the sculptures got to a new step or were completed. By the end of the week, the cardboard tube sculpture took up 3 different tables: one for taping, one for painting the outside and one for painting the inside. We installed the sculptures in waves; as soon as one was finished, I would assign a table to take the pieces outside and secure it in the ground. Bamboo skewers and tape helped to hold up some of the more flexible artwork. The students taped laminated signs about installation art to the sides of some old magazine holders. Bamboo skewers were able to keep the sign boxes in place. The installation art made quite a splash! The students were so excited to see the finished projects they had helped with. Teachers and parents also commented on how much they enjoyed the artwork. It was a fun way to introduce an new art concept to our school’s community. A collaborative art project that revolves around the element of chance – second graders worked with their table to create sculptures using colorful paper scraps they chose randomly. My original inspiration for this project was to use up paper scraps. I saw photos on Art Actually and was excited to alter the project for my 2nd graders. As I started prepping for it, the core goal became to help 2nd graders embrace chance while teaching them about abstract sculpture. I couldn’t be more thrilled with how well the kids responded and how incredible the finished product looks. Choosing the 4 colors was the first “chance” element and it went over really well. I had a couple of kids say, “Oh I don’t like this color.” But once I causally said, “Well, it’s kind of like a surprise, isn’t it?” they were okay with not being able to choose. The next “chance” element was the paint. I had six closed containers of paint and I asked one person from each table to come pick a container. That was the color they used to paint their cardboard. This step was a little crazy because I had tables finishing at different times. Once a table finished and cleaned up, I had that group start drawing sketchbook pages, which helped to keep them focused. There was a bit of prep work for the second day; I spent 15 minutes before each class organizing cups of paper according to the pieces each table had taped onto their cardboard. This made the actual class time go so much smoother. I also mixed up the paste a couple weeks early because I was using a brand I hadn’t tried before. It was a weird chunky mess for several days. I was finally able to smooth it out using a paint stirrer attachment on my drill. I did a demo for each class and showed them how to wrap the paper strips around a pencil. I emphasized that you have the “let it grow” by taking it off the pencil and letting go of it. If they dipped it into the paste before doing this step, it would unravel with the paste dripping everywhere, which could get messy! I was surprised that I actually had to encourage them to dip their circles deeper into the paste. Many of them had a tendency to not get enough paste on the bottom of the circle. I also went around with a paintbrush and added a little extra paste to circles that looked like they were about to fall off. The finished artwork took several days to dry completely. They definitely took over my classroom for the week! Once they were dry, I was able to hang them up for our Showcase. I used command strips and a staple gun, in the future I think I would just use the staple gun. It was cheaper and held the artwork up better. The cardboard curls as it dries, so I tried to staple them on the two points that naturally touched the wall, so that it didn’t strain the art and cause the circles to pop off. Displayed together, these had an incredible visual impact. The kids loved looking at them as they walked to lunch and so many teacher commented on how cool it looked. It was one of those rare projects where both the process and the end product are fantastic! Students in third and fourth grade classes worked collaboratively to paint branches using analogous and complementary color schemes. Every quarter I get to collaborate with the Music and GT teacher to put on a Showcase for our students. I let my students choose two pieces of artwork from their portfolio, they help me mat it and we hang it in the hallways for a week. I like to have a collaborative project that changes every quarter. I use the same curriculum each quarter, so having a project that changes helps to break up the monotony of teaching the same assignments again and again. And it means there is a surprise installation that the school gets to look forward to each Showcase. I was able to find 6 branches to use by walking around the yard outside our school. The biggest prep component was mixing up the analogous colors for the first day. I mixed the whole set and then covered them with empty trays so they wouldn’t dry out. If you have more time or older students, you could have them mix the colors. I learned from the first class to give the students separate brushes for each color. The water thinned out the tempera paint so much that it lost it’s vibrancy. I hung up a laminated sign that explained how the students had used color theory. I hope that as students and teachers walk by, they will get to learn something new also! This was such a fun project to do, and an exciting way to introduce my 3rd and 4th graders to color theory. I love how the branches look in the outdoor spaces that we displayed them. I couldn’t have done the hanging part without help from the music teacher, so I highly recommend asking someone to assist you!